The family requests privacy. Please do not send flowers. Joe Kirk passed away on 25th July 2018. He would have celebrated his 94th birthday on 1st September this year.He is survived by his children Jeffrey and Gordon and his wife and lifelong partner Nan, to whom he had been married to for 72 years. In his youth, Joe was a competitive swimmer, a ballroom dancer and of course an avid breeder and supporter of pedigree dogs and with his wife Nan founded The Northern Ireland Non Sporting Breeds Society. They both served on many other Committees and he was an Officer on both Irish Collie Club and Shetland Sheepdog Club of N. Ireland and was involved in many Clubs in the South. Joe was long-time Secretary of Belfast Dog Show Society for many years and as an internationally respected judge was a regular judge at Crufts, Irish Kennel Club Shows and all the major shows in UK. 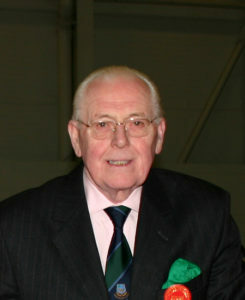 In the Show ring Joe had great success particularly with Rough Collies and Bearded Collies and his Rough Collie ‘Henry Higgins’ was a defining dog for the breed at that time. Despite his success Joe was always available to help many young exhibitors and judges in Ireland. From an administration point of view Joe gave his time and expertise to the Irish Kennel Club willingly and served on the General Purposes Committee for many years, travelling up and down to meetings at a time when the journey was arduous and sometimes dangerous. My family shared a lot of good times with Joe and he was always a gentle, kind, witty man who was a pleasure to be with. On behalf of the members of the Irish Kennel Club, both present and past may I express our gratitude for the wonderful service Joe gave to our organisation and offer our sincere sympathies to his wife Nan and his extended family.